Adriana Trigiani, the New York Times bestselling author of the blockbuster epic The Shoemaker's Wife, returns with her biggest and boldest novel yet, a hypnotic tale based on a true story and filled with her signature elements: family ties, artistry, romance, and adventure. Born in the golden age of Hollywood, All the Stars in the Heavens captures the luster, drama, power, and secrets that could only thrive in the studio system—viewed through the lives of an unforgettable cast of players creating magic on the screen and behind the scenes. In this spectacular saga as radiant, thrilling, and beguiling as Hollywood itself, Adriana Trigiani takes us back to Tinsel Town's golden age—an era as brutal as it was resplendent—and into the complex and glamorous world of a young actress hungry for fame and success. With meticulous, beautiful detail, Trigiani paints a rich, historical landscape of 1930s Los Angeles, where European and American artisans flocked to pursue the ultimate dream: to tell stories on the silver screen. The movie business is booming in 1935 when twenty-one-year-old Loretta Young meets thirty-four-year-old Clark Gable on the set of The Call of the Wild. Though he's already married, Gable falls for the stunning and vivacious young actress instantly. Far from the glittering lights of Hollywood, Sister Alda Ducci has been forced to leave her convent and begin a new journey that leads her to Loretta. Becoming Miss Young's secretary, the innocent and pious young Alda must navigate the wild terrain of Hollywood with fierce determination and a moral code that derives from her Italian roots. Over the course of decades, she and Loretta encounter scandal and adventure, choose love and passion, and forge an enduring bond of love and loyalty that will be put to the test when they eventually face the greatest obstacle of their lives. Anchored by Trigiani's masterful storytelling that takes you on a worldwide ride of adventure from Hollywood to the shores of southern Italy, this mesmerizing epic is, at its heart, a luminous tale of the most cherished ties that bind. Brimming with larger-than-life characters both real and fictional—including stars Spencer Tracy, Myrna Loy, David Niven, Hattie McDaniel and more—it is it is the unforgettable story of one of cinema's greatest love affairs during the golden age of American movie making. I love classic Hollywood, and have heard the story of Clark Gable and Loretta Young over the years. I was intrigued when I learned that one of my favorite authors, Adriana Trigiani, had written a book about old time Hollywood and this story. And what a story this is! We meet Loretta Young and her family through the eyes of a young former novice named Alda. As she gets to know the family, and glimpses life in Hollywood, so do we. What a perfect introduction to the world of this novel. "Just as a blank page is eventually filled with letters in blue ink, these letters become words, which become sentences, which become the scene, which becomes the story that carries the truth. The truth is where the story begins. "The story isn't the art, nor its players, nor the paint, the technique, or the interpretation. The feelings are the art. The rest is just the way in" (p. 4). The storytelling in this book is so rich and compelling. 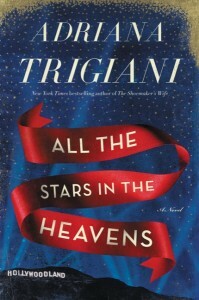 As always with Trigiani's books, the beauty is in the details. The historical details in this book are exceptional. Both Alda Ducci and Loretta Young are sympathetic and multi-dimensional characters. I loved reading about their lives and the friendship they build. "Here's a short history of motion pictures. About twenty years ago, the Schenk brothers were running an amusement park in Palisades, New Jersey. They noticed that people were spending a lot of money watching the nickelodeons, so they hatched a scheme to put words and music to the pictures. ... Now the producers tell us that movies began in the theater, that plays were the inspiration. Classics. But that's a lot of hooey. We're a carnival amusement" (p. 69). The love story between Loretta Young and Clark Gable is beautifully told. Their affair had such a strong effect on both their lives, and results in a "secret" that is at the heart of the novel. I cannot recommend this book highly enough to fans of Adriana Trigiani, to anyone who loves historical fiction, or to readers who want to be transported to old time Hollywood for a fascinating visit. Five enthusiastic stars! 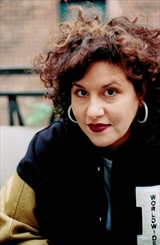 Adriana Trigiani is an award-winning playwright, television writer, and documentary filmmaker. Her books include the New York Times bestseller The Shoemaker's Wife; the Big Stone Gap series; Very Valentine; Brava, Valentine; Lucia, Lucia; and the bestselling memoir Don't Sing at the Table, as well as the young adult novels Viola in Reel Life and Viola in the Spotlight. She wrote the screenplay for Big Stone Gap, which she also directed. She lives in New York City with her husband and daughter. I received a copy of this book from TLC Book Tours in exchange for an honest review. That quote from the introduction is fantastic! I'm thrilled that you loved this book so much. Thank you for being on the tour! Trish, thanks for the visit! I love Adriana Trigiani's books, and this is definitely one of my favorite 2015 reads.